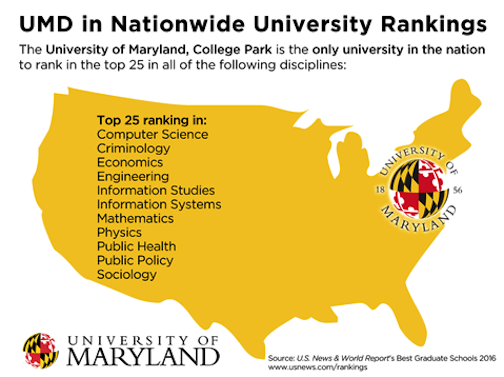 The University of Maryland (commonly referred to as UMD, or just Maryland) is one of the most frequently searched universities in the United States, according to a recent internet keyword search of American colleges. UMD is a public research university whose main campus is located in College Park, approximately four miles from Washington DC. 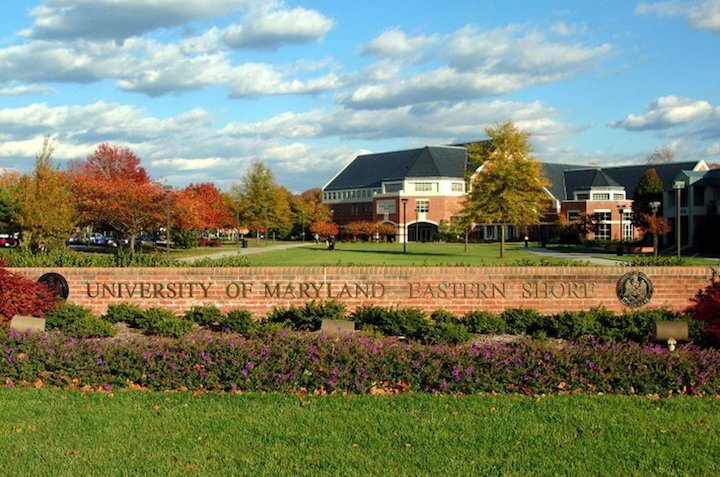 Founded in 1856, UMD currently maintains an enrollment of nearly 40,000 students each semester. Roughly three out of four UMD students are studying at the undergraduate level. UMD offers nearly 100 undergraduate majors, as well as just as many more graduate degrees and professional certificate programs. The undergraduate acceptance rate for Maryland is about 45%. The average student faculty ratio is about 17 to 1. For the past three years, the Princeton Review has ranked UMD among the top 10 universities in America for Innovation and Entrepreneurship. 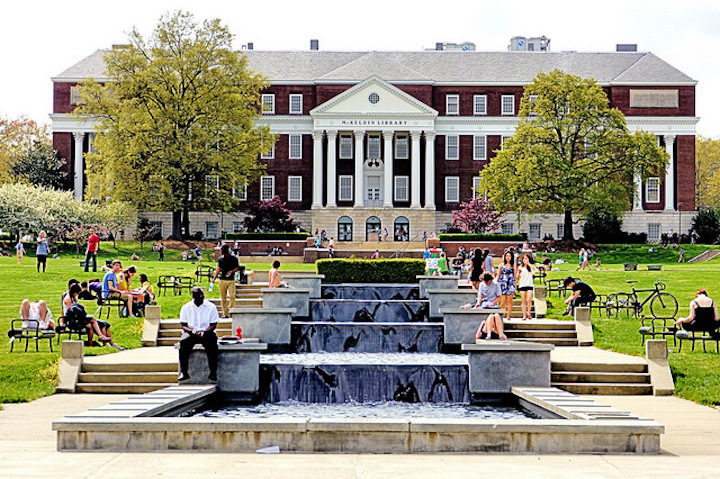 Notable graduates of the University of Maryland include many dozen political figures and a number of Nobel laureates, as well as basketball star Len Bias, TV personality Connie Chung, Seinfeld creator Larry David, and many others. This university is accredited by the Middle States Commission on Higher Education. Shown above: An aerial view of the UMD campus in College Park. Here are the answers to some frequently asked questions about the University of Maryland. 1. Where is the University of Maryland? 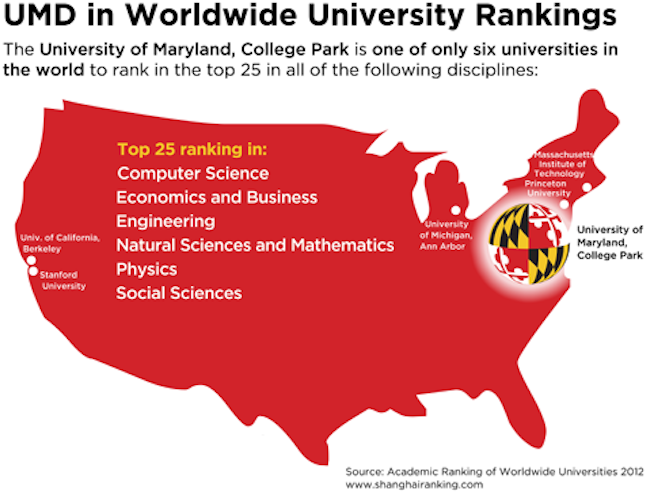 The main campus of UMD is located in College Park, Maryland, although UMD has additional locations in Baltimore County. Above: The Eastern Shore campus of UMD. 2. What is the organizational structure of the University of Maryland? 3. What undergraduate studies are offered at the University of Maryland? Undergraduate course offerings at UMD cover a wide range of topics. Above: Students bask near a peaceful waterfall in front of the McKeldin Library. 4. What graduate programs are available at the University of Maryland? Click here to see a Complete List of PhD Programs at UMD. Above: The UMD campus in Baltimore. 5. How much does it cost to attend the University of Maryland? $35,216 per year for enrollments from out of state. The above cost is for tuition only, and does not include room & board, books & supplies, personal expenses, and mandatory fees. $1,548 per credit hour for enrollments from out of state. The above costs do not include room and board, books and supplies, personal expenses, or mandatory fees. 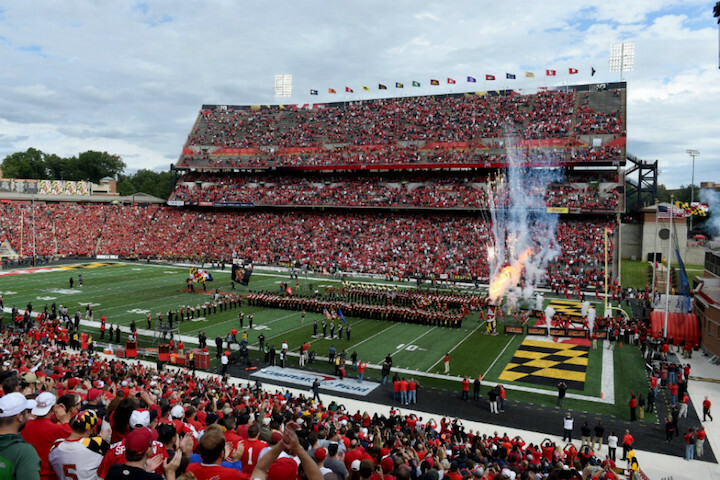 Above: Fans gather to watch the Terrapins play at Maryland Stadium. Above: The UMD School of Nursing. 6. What is the University of Maryland campus like? The main campus of UMD spans about 1,250 acres in College Park, with a 400-acre "urban forest" right next to the campus. College Park is conveniently located just about ten miles northeast of Washington DC. The central lawn of the College Park campus (known as McKeldin Mall) is surrounded by stunning, white-columned buildings of red brick Georgian architecture. The campus has so many trees (7,500+), that the American Public Gardens Association has officially designated the College Park campus of UMD as an "arboretum and botanical garden." Campus landmarks and attractions include the McKeldin Library, the UMD Art Gallery, and the Clarice Smith Performing Arts Center, among others. Just east of the campus is Baltimore Avenue, featuring many conveniences and affordable eateries. The campus is bordered on the west by University Boulevard. Student housing is available at UMD, both on and off campus. The Baltimore campus of UMD consists of 58 buildings, and is located very near Baltimore's famous Lexington Market. 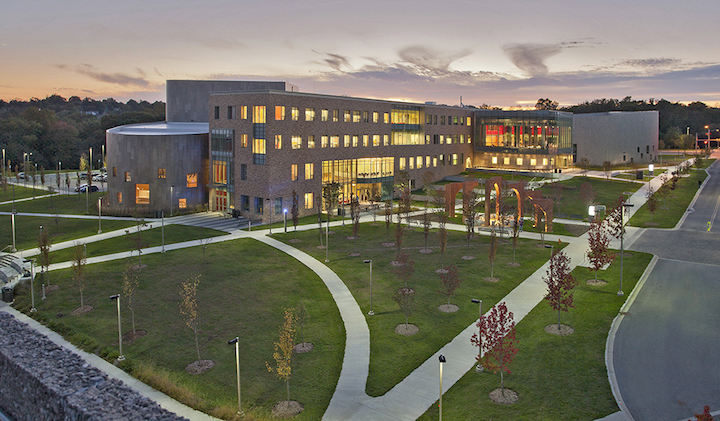 The 114,000-square-foot campus center features dining facilities, recreational facilities, meeting rooms, and more. Public transportation is made easy, by way of the Baltimore Light Rail System. The University Street station is conveniently situated at the eastern edge of the UMD campus. The school colors are red, gold, white, and black. The varsity athletes at UMD are called the Terrapins. They play for the NCAA Division 1 - Big Ten Conference. UMD also features an award winning dance team. Also available on campus are more than a few club and intramural sports, such as some of the ones listed above, as well as aerobics, badminton, dance, figure skating, and ice hockey, among others. Aside form athletics, UMD also offers numerous on-campus student organizations, in a broad range of interests. Student activity groups include an African Languages association, a campus magazine, a campus ministry, a cooking club, a karate club, a theater group, a film society, and an ROTC club, to name only a few. Above: The dance team from UMD at the 2014 National Championship, where they took 1st place. 7. What are the distance learning options at the University of Maryland? 8. What is the contact information for the University of Maryland? To reach the main campus of UMD, or for general information, call 301-405-1000. To reach the office of Undergraduate Admissions at UMD, call 301-314-8377. For the Graduate Admissions office of UMD, call 301-405-3644. To reach UMD toll free, call 800-422-5867. To contact the Eastern Shore campus of UMD, call 410-651-2200. To reach the Baltimore County facility of UMD, call 410-455-1000.